Klayman: Giuliani Needs to Resign for the Good of the President! He Is an Incompetent Loose Canon! Go to www.FreedomWatchUSA.org to Sign Petition to Appoint Klayman as Special Counsel. Also Donate and Share! 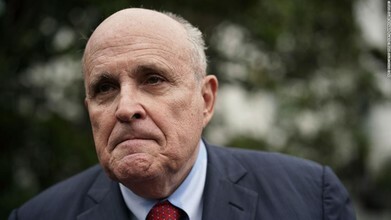 (CNN)Rudy Giuliani said Wednesday that he never denied President Donald Trump's campaign colluded with the Russian government during the 2016 campaign, only that the President himself was not involved in collusion. In an interview with CNN's Chris Cuomo on "Cuomo Prime Time," Giuliani, a former New York mayor and Trump's attorney, said he doesn't know if other people in the campaign, including former campaign chairman Paul Manafort, were working with the Kremlin during the 2016 presidential race. "I never said there was no collusion between the campaign, or people in the campaign," Giuliani said. Contact Freedom Watch at daj142182@gmail.com or (424) 274 2579.